I saw a yurt at S&W and I thought about you. It was totally felted, and the guy inside was doing a demonstration on wet felting. His stuff was amazing. You can see some of the rugs on the outside of the structure (I can only imagine what it smelled like the next day, in the pouring rain; I don’t envy him the drive back and eventual airing out of said yurt). It’s all either wet-felted or needle-felted. There’s a rack at back (which you can’t see) that is full of silk scarves onto which he’s needle felted patterns. Aside from the alpaca and the death-metal sheep, this was by far the coolest thing I saw all day. I am so covetous of this thing. 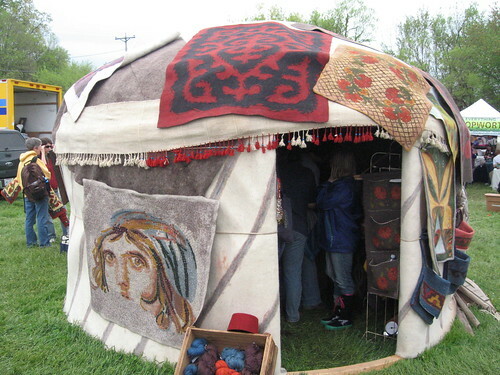 I want a yurt desperately, even though it does not fit with anything I do. This is okay. I don’t really need a yurt, anyhow. But it’s fun to think about (I’d so totally set it up in the front yard, and then would have to shoo out the winos and homeless guys). And there was one other thing we saw that was awesome, which was the fog in the mountains on the way up and back. It was spectacular. It kind of rolled across the highway and made it hard to see what was in front of you. It was like we’d left Earth and gone to Middle-Earth or Narnia or way up in the mountains of China or somewhere else magical. I tried very hard (and succeeded) not to think about The Mist (ohmygodgiantbugsDONOTWANT). I am amazed this photo came out so well. I got a video, but can’t find it now. Oh, well. You get the idea. I was so glad I didn’t think about it until afterward. That would’ve been really scary. 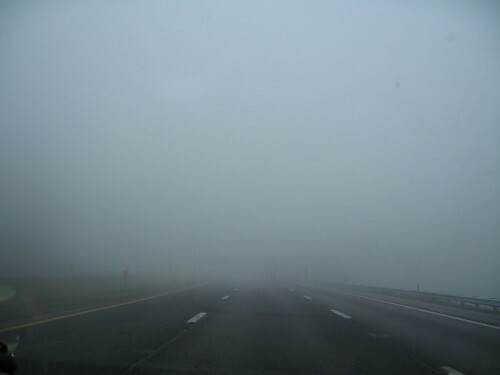 I remember the first fog I ever saw (in HP, 1st year). The Mist was ALL I could think about; it was hard to cross the Midway for class!